According to Gifam (the French association of household appliances manufacturers), sales of household appliances increased 1.7% in 2016. Small household appliances continued their upward trend with an increase of 3.2%, while the sales value of large household appliances increased 0.8%. Demand in this segment is driven by innovative products. The French furniture industry research organisation IPEA stated that the French furniture market returned to growth in 2015 and recorded a 2.3% increase in 2016, in line with a rebound in the housing market. However, furniture sales growth slowed down in H2 of 2016 after a robust performance in H1. According to the research firm GfK, consumer electronics sales grew 2% in 2016 after five years of decline, mainly driven by the shift to TNT HD television in April 2016, while the European Football Championship boosted TV sales (up 30% in volume in H1 of 2016). 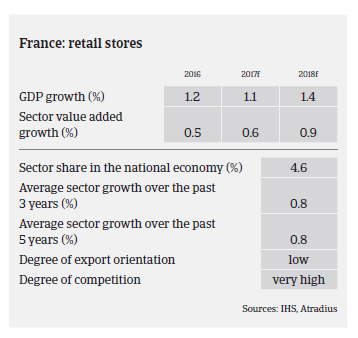 The French consumer durables retail business environment – similarly to that in other advanced markets - is highly competitive among the different distribution networks, and this competition is additionally fuelled by the increasing market share of online retailers. There is significant pressure on sales prices, which explains the generally low profitability in the sector. However, given the positive sales growth seen in 2016, businesses’ profitability should remain stable. Further sales growth in 2017 is uncertain as consumer confidence could be affected by the outcome of the presidential and parliamentary elections. Over the last couple of years there has been an on-going concentration process in the market, as businesses try to increase their market share and/or obtain critical market size. The growing concentration is also accompanied by alliances, e.g. in September 2016 retailer Casino and furniture chain Conforama launched a joint central purchasing agency in order to optimise their household appliances purchases. Other retailers expand their franchise system in order to extend their geographical presence, which reinforces competitive pressure on independent wholesalers and retailers. 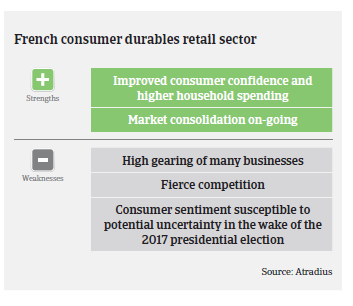 In general gearing of consumer durable retailers is rather high, given their need to finance working capital requirements and inventories. Moreover, there are peak seasons and special events, (such as the switch to TNT HD) which temporarily require additional pre-financing. Loans are also required to finance the opening of new stores in order to extend geographical presence. 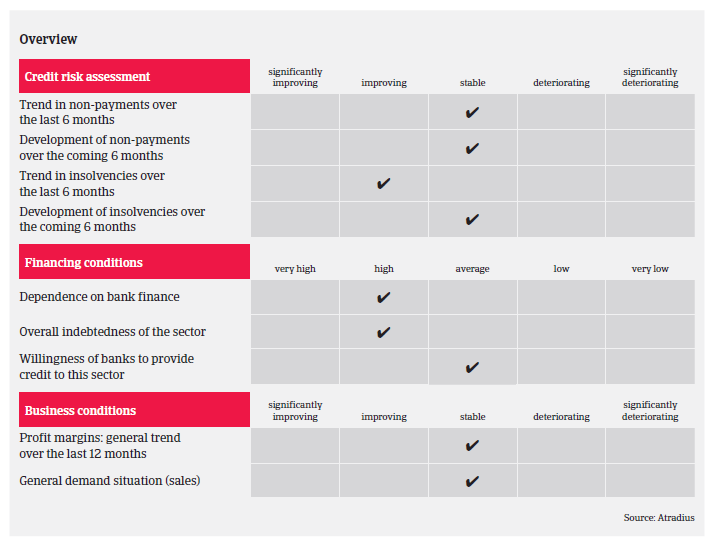 Banks are principally not restrictive to lending to the sector, but their willingness mainly depends on an individual retailer´s creditworthiness. Payments in the industry take about 45 days on average. The current level of non-payment notifications is rather low, and payment delays are not expected to record major increases in 2017. Competition, however, will remain fierce, mainly affecting independent and smaller retailers. While retail insolvencies decreased in 2016, we expect them to level off in 2017. However, given the competitive and volatile market environment there is always the risk that important players fail, as seen with furniture group Mobilier Européen in 2014 and Euronics /Logitec (household appliances) at the end of 2015. The recovery of the construction sector has finally gained some momentum, but competition remains fierce, and prices and profitability are still low.